At least for a few more weeks it’s the best stadium in Poland’s most football-crazy region of Upper Silesia. And for years to come this robust project will remain a landmark of Tychy. Building a new stadium put Tychy on Polish football map again, seeing record crowds in the 3rd league as well as female international games. 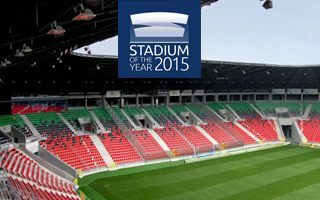 All this with a tight budget and no delays – some of the arguments to make you vote for Stadion Miejski Tychy as Stadium of the Year! It’s hardly the biggest stadium in Poland, but for the time being it remains the single largest and best football ground throughout Upper Silesia, at least until Arena Zabrze finally opens later this week. The new stadium in Tychy cost just over $30 million, while offering international standards, it could even host Bundesliga games in theory. For now there’s nothing as prestigious as the Bundesliga awaiting the stadium, though sold-out opening did include 1. FC Köln. The opening did come in a rather unfortunate moment, seeing local GKS Tychy relegated to the third league just before. Still, crowds reaching over 11,000 at peak are something unseen on this level in Poland, proving that potential is there. The stadium is designed to be visitor-friendly, managing to avoid extensive fencing outside, very common in Poland. Visitors may walk up to the very walls, which also proved handy in attracting commercial lease-holders on the ground floor. Its facades, main concourse and seating are all kept in GKS Tychy’s colours, giving it a clear identity and making the building very popular among locals almost instantly!